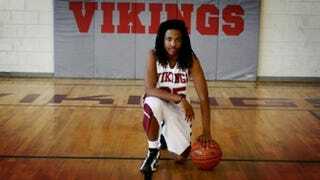 It's been nearly a year since 17-year-old Kendrick Johnson was found dead, rolled up inside of a mat in the gym of his Georgia high school. Investigators concluded that he died in a freak accident, falling head-first while reaching for a shoe and becoming trapped, the Associated Press reports. But almost a full day passed before his body was discovered on Jan. 11, 2013, inside the gym of Lowndes High School, a sprawling campus attended by 3,000 students near the Georgia-Florida state line, the AP says. For some people, a ruling by investigators would close a case, but Kenneth and Jacquelyn Johnson, Kendrick's parents, have not stopped pushing to find out just what happened to their beloved son. They even hired Benjamin Crump, the Florida attorney who represented Trayvon Martin's family. They also obtained a court order to exhume their son's body and hired a private pathologist to perform a second autopsy. The second autopsy revealed that Kendrick’s organs were missing. "My family won't be satisfied until someone is behind bars and someone is convicted for what happened," Kenneth Johnson told the AP. "Going over it with common sense, how can it be an accident?" The parents, along with their attorney, suspect that local law enforcement may have tried to conceal evidence that someone killed the teenager, the AP says. A post-mortem photograph of Kendrick’s swollen, distorted face has been posted by the family on protest signs and websites to help rally support for reopening the investigation, the AP says. They are not alone in their suspicions. Last month, an estimated 200 people joined the family outside the Georgia Capitol in Atlanta for a rally demanding answers. The gathering was billed as: "Who Killed K.J.?" U.S. Attorney Michael Moore in Macon stepped in on Oct. 31, 2013, saying his office would review the case, including the school video and conflicting autopsies. Those findings have not yet been released. "At best it was incompetence," Crump told the AP about the investigation. "At worst it was some conspiracy to conceal the truth."